Here I am drafting a steaming hot take on how the compact adventure bike market is about to explode, and Honda debuts the CRF250L Rally. This is what true freedom looks like. Adventure bikes, also known as “dual-sports,” are designed to cover tremendous distances over a wide range of terrains. Ideally, they can do it reliably. Think of them as the SUV of the motorcycle world. In essence the ultimate adventure bike is somewhere between a dirt bike and a cruiser. In practice, “small” adventure bikes used to pretty much just be street-legal dirt bikes. Now they seem to be evolving. And manufacturers are actually making them. At least, here’s Honda’s earnest entry! The $5,899 Honda CRF250L Rally has the long-travel suspension you need bound over bumps, plus the wind deflection and (presumably) reliability you want for long rides to wherever. 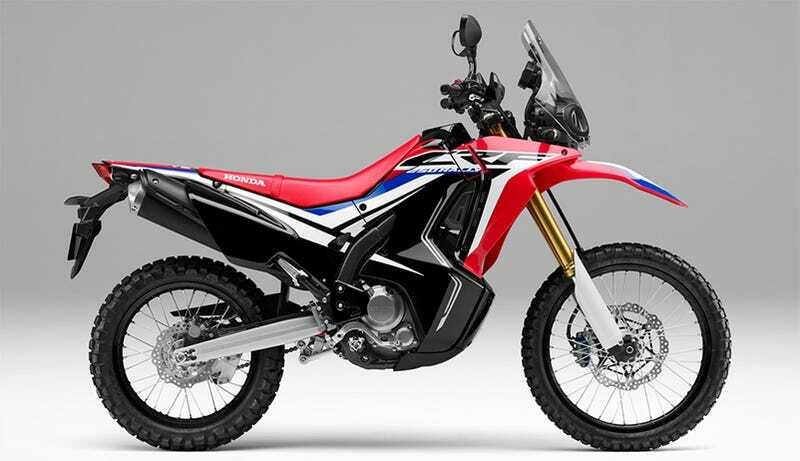 Honda’s press release says the new small-sized adventure bike is inspired by its Dakar Rally racer, with overall improvements focused on “increasing power and improving throttle response.” Also it looks boss. Sure wish that release included more than one photo. Pictured: Honda Africa Twin. This look is hot and still heating right now. Ever since the mighty $13,000 Honda Africa Twin came out, people have been speculating on whether Honda would do a small-scale equivalent with less power for less money. Well, this is basically it. While Honda’s updating the CRF250L street-legal dirt bike for 2017, they’re brilliantly adding this fairing’d Rally version as well for those looking to throw a leg over their saddle, ride into the wilderness and come back whenever. The regular (non “Rally”) CRF250L. Honda’s added a little more power to these 250s with a new computer tune, bigger throttle-body, intake and exhaust. Both these bikes will be out in March 2017, but which time I think we’re going to have a lot more little adventure machines on the market. Honda has not released a full spec sheet on the 2017 CRF250Ls, but I think we can expect pretty similar major numbers to the current model’s weight (320 pounds) seat height (34.7 inches) fuel economy (73 MPG) and wheelbase (56.9 inches). I’d expect the Rally will be a bit heavier due to the extra equipment, but might hit higher MPG’s on account of the long-range-oriented tune. It looks like Honda hasn’t done much besides add a fairing, ABS and a little extra fuel. Which is exactly how to create an inexpensive machine to take riders anywhere. I really hope this is a harbinger of an industry trend.